← Book Review: Twitter Girl by Nic Tatano. 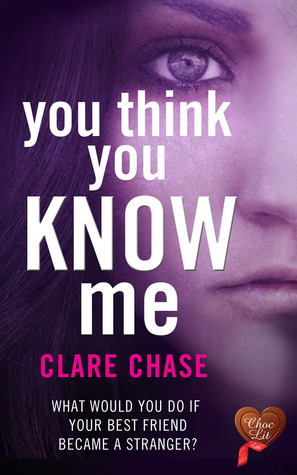 Book Review: ‘You Think You Know Me’ by Clare Chase. Sometimes its not easy to tell the good guys from the bad…. First off, I LOVED THIS BOOK! I read the synopsis and thought it sounded good, but actually the description doesn’t do it enough justice. This book is filled with mystery and intrigue right from the beginning, all the way through to the end. It begins with Anna attending an art gallery launch belonging to an old university friend. Anna had lost contact with Seb, but their relationship soon gets back on track. At this same event, Anna meets a stranger who we learn is called Darrick. Anna can’t stop thinking about him, despite many people warning her off him. We know there is a bad guy somewhere within this story, but we don’t know who it is or what exactly they have done or are still going to do…..
Anna has to think who she should trust! The storyline made me wonder what I would do!! Would I follow my heart and my lust and keep seeing the new man? Or would I trust the opinions of an old friend, who I haven’t seen for years, but when we were friends, we were good friends. The title is a great title for this book, its very appropriate. “You Think You Know Me”…….. do you really???? Its so good. Throughout the book, I suspected everybody. I even suspected Sally and Alicia at points!! They are Anna’s housemates. Sally loves to talk and share with Anna, and Alicia is Anna’s cousin. She is rather bossy and likes to think she is keeping Anna on the right tracks and giving her all the advice that she thinks Anna should be taking! Anna is a great lead character. She is a free lance journalist, and has a journalistic mind wanting to explore the information that she sees as possible evidence. She wants to find out the truth before making any decisions. Despite everybody telling her what she should be doing or what she should be thinking, she wants to find out for herself. The author keeps you guessing and on the edge of your seat right til the last chapter. The end of this book is fantastic, I loved the ending and when I got close, I couldn’t put it down. I love this author after reading this one book, and hope there is lots more coming from Clare Chase’s imagination. You can buy this book on Amazon now. Publisher: Choc Lit, December 2014. If you have read or intend to read this book, I would love to hear from you. Thanks so much for the wonderful review – I’m really delighted you enjoyed the book! Thank you for reading it and commenting. Its so nice when authors visit your site and read the reviews. I loved the book and look forward to reading more of your books.